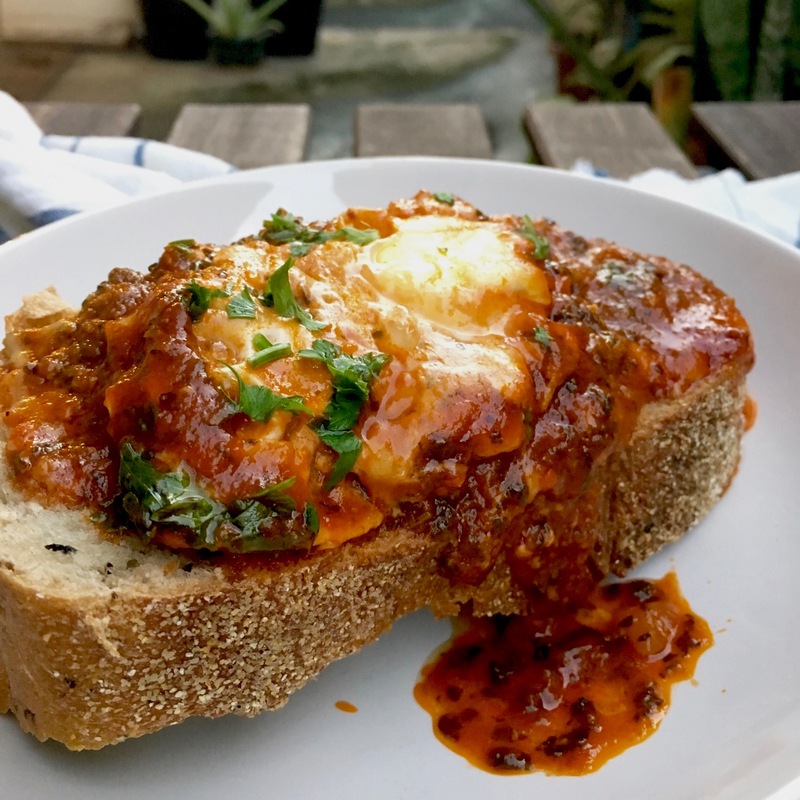 How do you make a great shakshuka? Well that is totally up to your taste I say! Traditional shakshuka has some wonderful flavours from crushed tomatoes, lots of garlic, roasted hot green peppers, cumin and paprika. Really though, this is a dish that can be enjoyed less traditionally as well. Super versatile and so easy to make, it is also very quick to prepare. You really can switch up the herbs and spices and add more vegetables, sausages, cheese and legumes as well to make it your own. It’s a perfect little dish for emptying the fridge of all those veggies you know will have to be thrown out if not used. It’s such and impressive dish that was traditionally served for dinner or as an evening meal. But because of the eggs in it, has easily become popular as a breakfast food too. You can really enjoy it for any meal of the day. My version today I would say is leaning towards an Italian flavoured shakshuka. I usually make it, as I said in my IG post earlier today, with a lot of sweet onions and sweet peppers and cilantro/chadon beni which I love served with nice crusty bread and avocado. But I thought I would switch it up. Mine was super duper spicy because the pimento peppers I used were not mild at all they were very spicy. (Note to self: always try a piece of the pepper before you add it to a recipe) That and add on the chilli flakes and we had ourself some very fiery shakshuka. Still was super good!! I’m not afraid of the heat!! Drop in your eggs and let them cook to almost what you desire them to be leaving room for them to cook a little more when you transfer them to the oven. I love mine runny but let them cook to your preference. Toss in the cheese and put in the oven to broil and watch skillet carefully. You only need to have it under the broiler for a few minutes or just enough for the cheese to melt and get a slight color. You do not want to overcook the eggs because well, that would just be boring! Sprinkle on the fresh parsley and serve with a nice hearty bread to mop up the sauce. 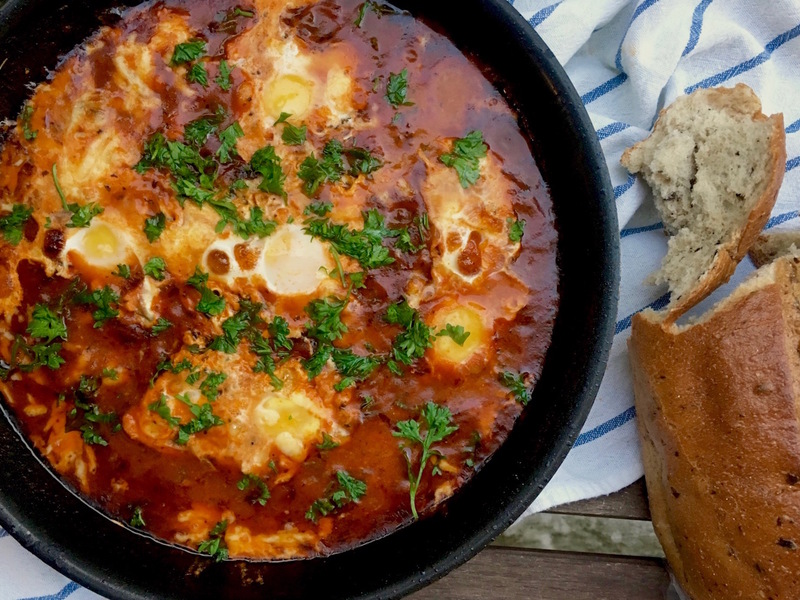 Hope you enjoy this little variation but please do let me know how you like your shakshuka! !